In this episode Hanna wears pink and yellow nail polish. Pink on her thumb, index finger and middle finger. Yellow on her ring finger and pinkie. I not only decided to turn the colors around but also do it metallic and glitter instead of just pink & yellow. 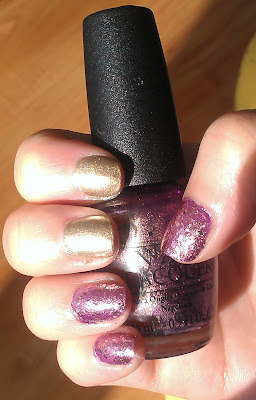 On my index finger and middle finger I wear Heart of gold [ Topshop]. And on my ring finger, pinkie and thumb I'm wearing It's my year [OPI] and A cut above [Essie]. 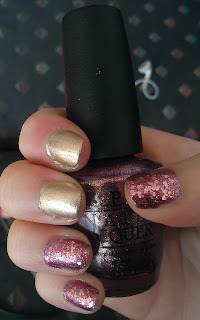 It's my year is a glittery pink with a metallic gold sheen and is a perfect in combination with A cut above. 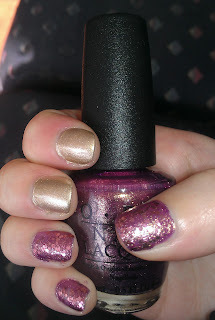 It's a shame that the camera didn't really pick up the metallic gold sheen in the nail polish because in real life my nails look rose gold but on the pictures they just look glittery pink. Are glitter or metallics nothing for you but you still want the look? Than I would recommend for the yellow nail polish: Lightning by Sally hansen. And for the pink nail polish: Shorts story by OPI.